When intervening forces create a safe and secure environment to implement a whole of government approach, they simultaneously create opportunities for hitherto unnoticed and powerless opponents to do the same—and sometimes more successfully. 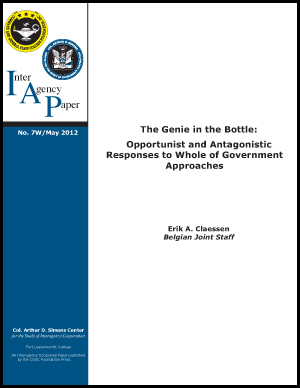 This paper makes the case that a whole of government approach is not a minimal concluding effort to replace an outfought opponent, but rather a full-fledged struggle to out-administer any opponent who exists or might emerge in the conflict area. A whole of government approach is only valid in dealing with security threats if it takes this reality into account. 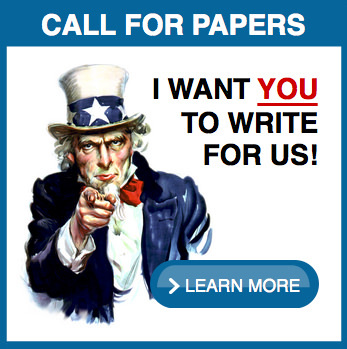 To support this argument, this paper first clarifies the problem by presenting a number of recent examples of emerging opponents who match a whole of government approach with an alternative that appeals more to the local populace. Next it analyzes the conceptual components of the mechanism behind this emergence. Finally, it derives operational implications from that analysis by proposing measures and precautions that should supplement a whole of government approach to increase its validity in dealing with emerging, adaptive, and innovative security threats. Erik A. Claessen is a Belgian Army lieutenant colonel serving in the Strategy Department of the Belgian Joint Staff. 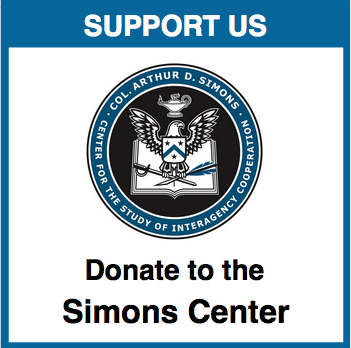 Claessen’s “The Genie in the Bottle: Opportunist and Antagonistic Responses to Whole of Government Approaches” won first place in the Simons Center Public Writing Competition conducted from September 2011 through March 2012. This IAP and the other two winning entries are also available in a special issue IAP which contains all three papers– download the IAP Special Issue here. 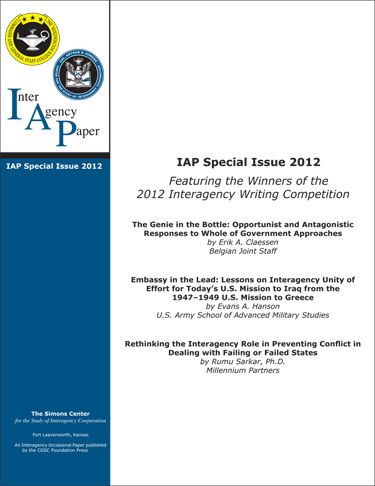 Download the IAP Special Issue 2012 which contains all three winning entries of the Simons Center Public Writing competition.